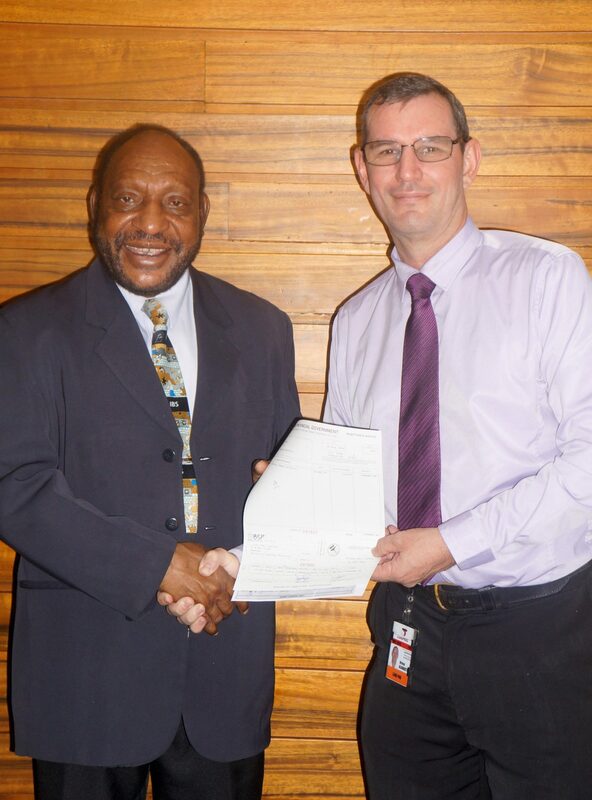 Link PNG, a subsidiary company of Air Niugini yesterday (Tuesday 30th August) received K500, 000 from Enga Provincial Government as second quarter payment for the 2016 airfare subsidies. Link PNG General Manager, Bruce Alabaster in receiving the cheque from Enga Governor, Sir Peter Ipatas, acknowledged the Provincial Government for its continuous commitment and assured that Link PNG will ensure discounted airfares for the Wapenamanda route are available, and also increase flight frequencies. Sir Ipatas said having daily flights would greatly assist the current joint venture projects undertaken by his provincial government such as that with an Israeli company to supply vegetables out of Enga to Port Moresby and overseas. Governor Ipatas has advised the Provincial Government that all public servants in the province must ensure they are flying into and out of Wapenamanda instead of Mt Hagen. He also called on the management of Porgera Joint Venture to review their air travel options to ensure their charter flights operate to Wapenamanda instead of Mt Hagen. The Enga Provincial Government has been providing airfare subsidies for the last 15 years. The arrangement is very important for the people of Enga as they do not have to drive for hours to reach Mt Hagen to catch the next available flight. Link PNG is currently working to introduce an updated schedule with increased frequency allowing for daily flights between Port Moresby and Wapenamanda. It currently operates five times a week into Wapenamanda airport.